Now that spring is officially here, we are all about delicious spring vegetables like artichokes and asparagus. While Mathlete isn’t as big of a fan, I can’t get enough asparagus! I just love it. To make him a little happier about eating it so often, I make him prosciutto wrapped asparagus. We love this as a spring side dish and it goes great with just about everything. The prosciutto adds just the right amount of saltiness and a little crunch as it roasts in the oven. I drizzle it with delicious hollandaise sauce for an extra punch of flavor. With Easter coming up, this would make a fantastic addition to an Easter brunch menu for sure. 1. Preheat oven to 400 degrees. Line a rimmed baking sheet with foil. Set aside. 2. Separate asparagus into groups of 3-4 depending on their size. Wrap each bundle with one slice of prosciutto. Lay on prepared baking sheet. Drizzle with olive oil and season with pepper. Bake in preheated oven for 10 minutes or until asparagus is done and prosciutto has started to crisp. 3. Meanwhile, combine egg yolks, mustard and lemon juice in a blender. Blend for about 5 seconds. With the blender on high, add melted butter in a slow steady stream. 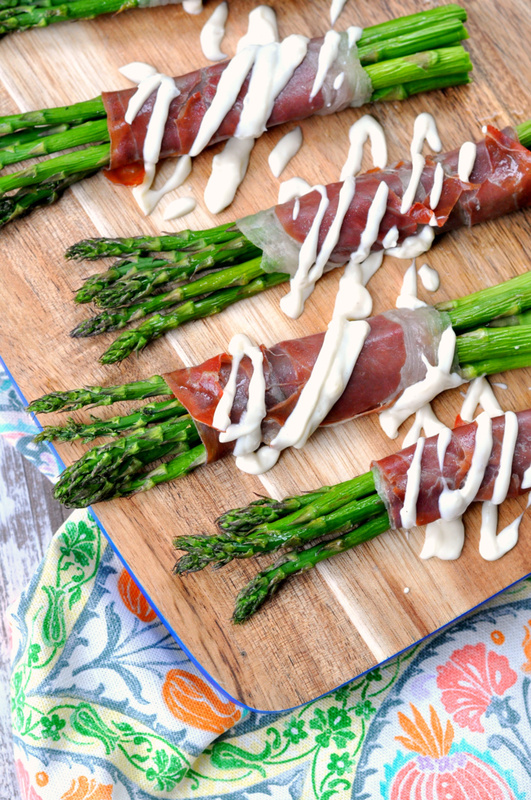 Turn off blender and drizzle sauce over asparagus bundles. This was my first time making hollandaise in the blender and it was seriously so easy! I feel like I want to make it all the time and serve it on everything. 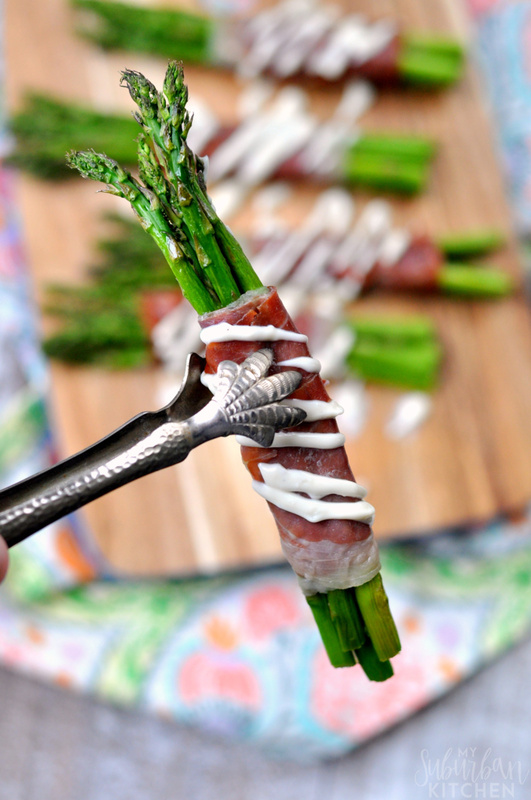 For now, I’ll stick with these prosciutto wrapped asparagus. What are your favorite spring vegetables? Will your family members only eat green vegetables if they are wrapped in prosciutto or bacon like mine? Preheat oven to 400 degrees. Line a rimmed baking sheet with foil. Set aside. Separate asparagus into groups of 3-4 depending on their size. Wrap each bundle with one slice of prosciutto. Lay on prepared baking sheet. Drizzle with olive oil and season with pepper. Bake in preheated oven for 10 minutes or until asparagus is done and prosciutto has started to crisp. Meanwhile, combine egg yolks, mustard and lemon juice in a blender. Blend for about 5 seconds. With the blender on high, add melted butter in a slow steady stream. 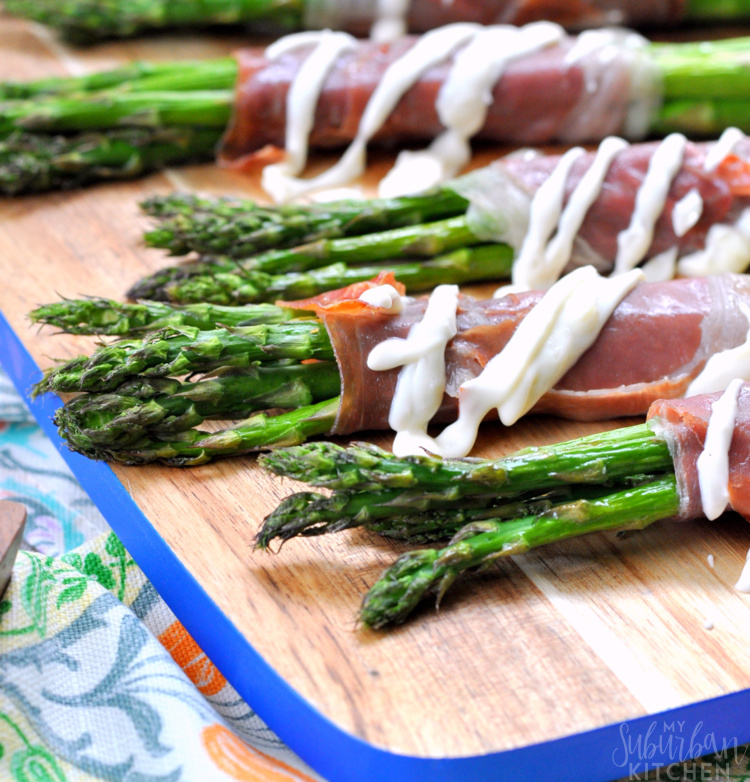 Turn off blender and drizzle sauce over asparagus bundles. It sounds as good as it looks! thanks for sharing on the What’s for Dinner link up! Looks yummy! Thank you for sharing on Merry Monday! Have a great week! These are so pretty! I have tried wrapping asparagus in bacon, but I think prosciutto would be even better. I’m with you on the deliciousness of asparagus. This is one way I have not tried it but now I want to. I’ve been looking for prosciutto appetizer recipes this week and happy I found this one. This looks so good, I’m sure my guests will love it! We love asparagus and this looks so yummy.Thanks for sharing at Over The Moon Party.